In the most recent decade, Durham has experienced a large influx of members of Generation Y, otherwise known as the Millennials. Millennials, defined throughout this paper as those born between 1980 and 1998 are currently between ages 16 and 34 and described as educated, diverse, creative, connected and open to change. Forecasted to be the most educated generation in the United States’ history, greater than one-third, or 37%, are unemployed or out of the workforce as a result of the nation’s 2008 Financial Crisis1. In the search for financial stability, members of this generation are drawn to Durham and its surrounding area because of the high caliber universities located there, as well as the promising jobs in healthcare, pharmaceuticals, and other professions found in Research Triangle Park. There is definite incentive for Durham officials to continue to attract and retain members of Generation Y to sustain the county’s high growth rate. The rise of an educated, and hopefully successful, generation will not only bring more young professionals into Durham, but will also benefit businesses and Durham’s overall economy. Typically, Millennials want to live in high-density neighborhoods, accessible to centers of business and employment either by walking or public transportation, and desire affordable urban rental spaces as they try to achieve financial stability. As Durham’s housing market becomes dominated by Millennials, demand for the aforementioned types of housing will certainly increase and it will be interesting to examine how Durham officials will respond to this changing demand. The goal of this paper is to explore which communities and neighborhoods Millennials are most attracted to and what factors determine their housing choice. To achieve this goal I will compare neighborhoods with the highest and lowest proportions of Millennials in Durham County and will go over the study of Millennials in Philadelphia conducted by the PEW Charitable Trusts. Because patterns have shown that members of this generation are more concerned with the quality of their surroundings than of their housing itself, I will focus primarily on which neighborhood and county qualities will play the largest role in these buyers’ decisions. Over the past five years, as the majority of members of Generation Y have reached their twenties and thirties, there has been increasing concern about the housing market. In the decades of their lives in which previous generations have driven growth in homeownership, many Millennials are putting off owning their own home due to massive amounts of student loans they must pay back and uncertainty in the job market. Additionally, members of this generation have been known to switch jobs more often than their parents, spending only about two years in each position before moving on to a new one. This creates another deterrent to homeownership, as Millennials prefer not to be tied down in any sense, and many members of Generation Y are even more hesitant after witnessing the suffering of their slightly older friends, many of whom had just bought their first home when the housing bubble burst. Furthermore, Millennials are marrying much later than previous generations with 75% still single between the ages of 18 and 28, compared to 67% of Generation X and only 52% of their baby boomer parents at the same age. This could also be working to slow home purchases, as marriage is a milestone that often coincides with homeownership. However, this must be taken in stride as members of Generation Y are also much more open to couples living together before marriage, and much more social in general, than previous generations were. This combination of both financial and preferential reasons against owning a home has led to largest drop in homeownership of any age group in the United States for 24 to 33 years old between 2005 and 2011. Despite this decline, approximately 93% of Millennial renters still plan to own their own home at some point in the future, indicating that this decline is driven by lack of funds and may only be temporary. Still, many experts point out that this reluctance to purchase now may leave members of Generation Y stuck in a far less favorable real estate market down the road and unable to reverse the trend. Although there are many benefits to purchasing a home now, with Trulia estimating that it is 35% cheaper to own a home than rent in America’s largest cities due to slightly undervalued homes and interest rates that are still historically low, many Millennials have insufficient funds and are too afraid of the commitment to one place to make a down payment. In addition to whether or not they will rent or buy, another important factor to consider when assessing the housing needs of this generation is whether or not needs are likely to change in the long term and by how much. While it is true that Millennials are currently seeking out small and affordable housing in high-density city centers, with only 14% living in rural areas, these needs may change in the next five to ten years. A look at the population between ages 20 to 34 in Philadelphia gives some insight into how this generation’s needs may be rapidly changing. During the period between 2006 and 2012, Philadelphia experienced a larger increase, totaling 6.1%, in members of Generation Y as a percentage of its total population than any other US city; however, this growth may only be short lived as slightly over half of the Millennials living in Philadelphia plan to relocate in the next five to ten years and would definitely not recommend the city as a good place to raise children. The there main considerations survey participants cited for planning to leave the city were jobs/career, school quality/child upbringing, and the crime/safety/drugs. 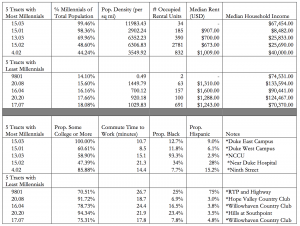 A full list and more detailed comparison between Millennials and older generations can be found in Table 1 (Appendix at end). From the case of Philadelphia, it is implied that successful policy to attract and retain Millennials will need to be adapted as the generation’s needs change and that Durham may benefit from incorporating both long-term and short-term strategies. 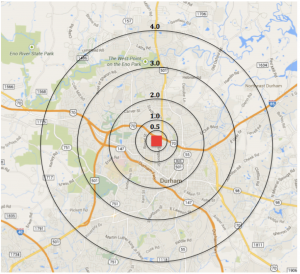 As shown in Figure 1, Millennials have located throughout Durham in accordance with what is predicted by patterns and preferences of the generation. The map shows Durham County, divided into 60 smaller census tracts as defined by the US Census Bureau for more uniform and complete data. 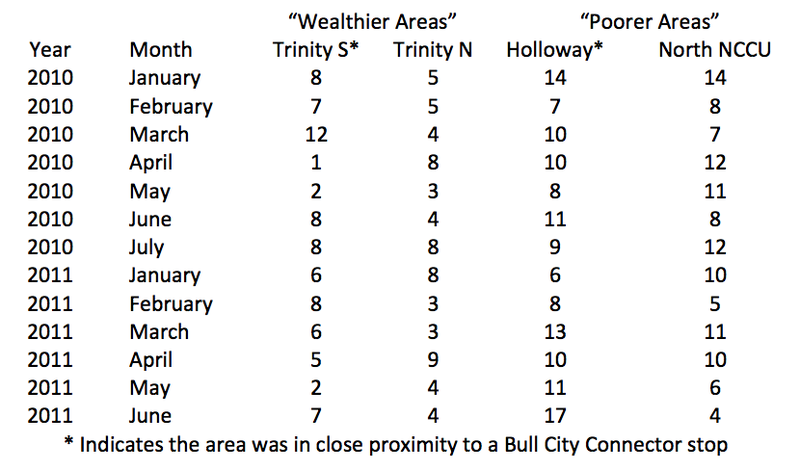 The five tracts with the highest proportions of 16 to 34 year olds are marked with green diamonds, while the five tracts with the lowest proportions of 16 to 34 years olds are marked with red circles. 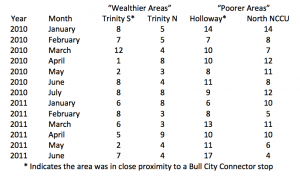 Even from a quick glance, it is apparent that the five tracts with the highest proportions of Millennials are clustered near the city-center while the five tracts with the lowest proportions of Millennials are scattered around the Durham County’s edges. Table 2, created by data obtained from the US Census Bureau American Community Survey five year estimates from 2008 to 2012, show some of the most relevant characteristics of each of these ten tracts and the differences between the two groups can be used to demonstrate which factors have led Millennials to distribute themselves as they have throughout Durham. 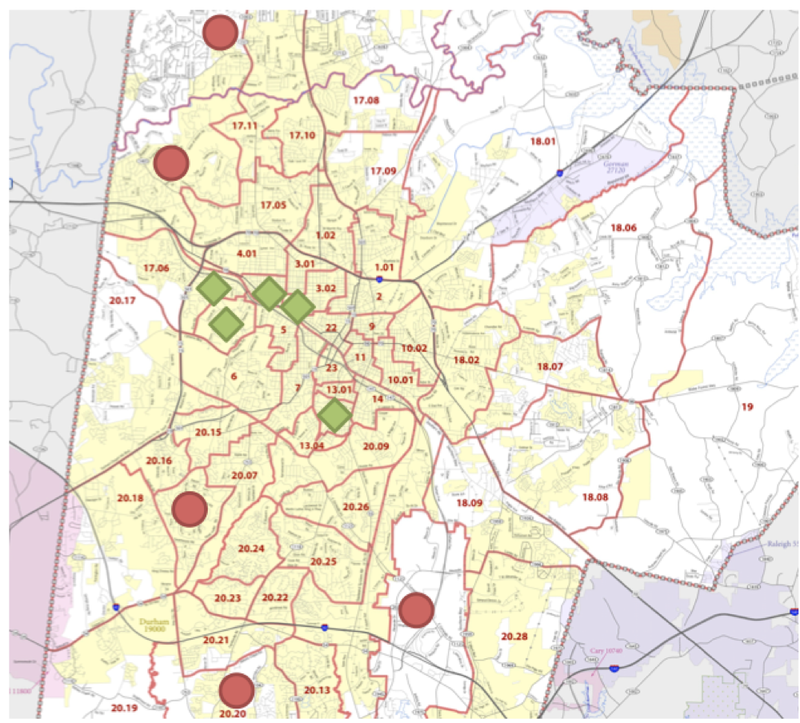 When examining the five census tracts with the highest proportions of Generation Y members living in them, it is not surprising that two, 15.03 and 15.01, contain Duke’s East and West Campuses, respectively, two, 15.02 and 4.02, correspond with areas touching Duke’s Campuses and the final tract, 13.03, contains North Carolina Central University’s campus. 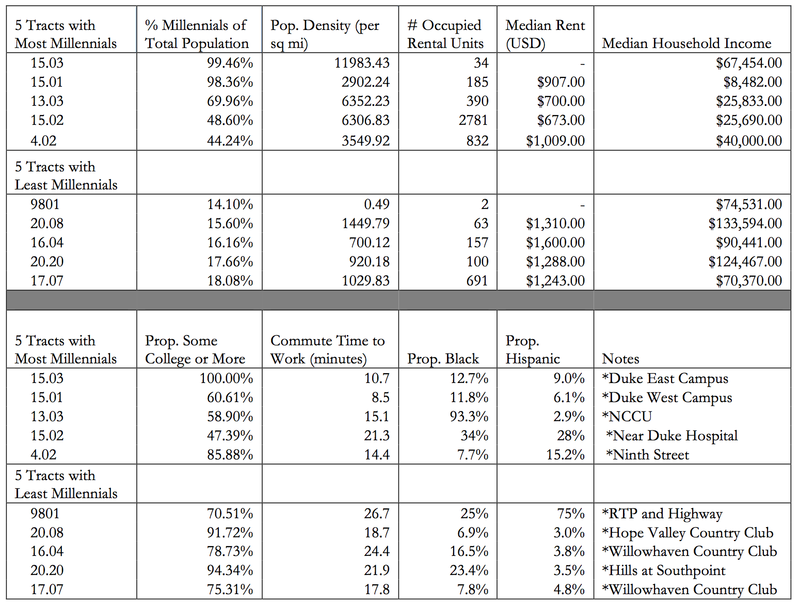 When examining the eight included characteristics of each tract, including population density, number of occupied rental units, median gross rent, median household income, proportion of residents with at least some college education, median commuting time to work, and the proportions of residents that are black and Hispanic, any extreme outliers can be explained by the presence of specific institutions in or adjacent to the tracts. For example, 100 percent of the population in tract 15.03 has at least some college education and the median household income, $67,454, is uncharacteristically higher than the surrounding area as a result of the presence of Duke’s East Campus, filling almost the entire tract. This fact also explains the lack of data to estimate the median gross rent. 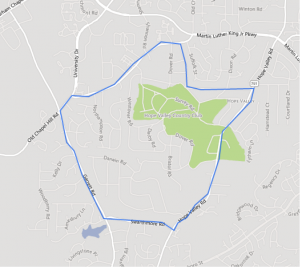 When examining the tracts with lowest proportions of Generation Y members, it is also not surprising that four out of five tracts feature either a golf or country club or luxury development, while the tract with the absolute lowest proportion of Millennials, 9801, is fairly non-residential including two major highways and Research Triangle Park. 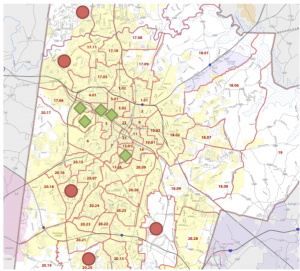 Again, the aforementioned features of each tract can explain away any outliers, such as the extremely low population density and proportion of Millennials in tract 9801, as young adults commute to work in RTP, but do not live there. The differences between the groups with high and low proportions of Millennials were also not surprising. Because of their documented affinity for high-density city centers, the clustering seen in Figure 1 and higher population densities of the tracts with high proportions of Millennials were to be expected. 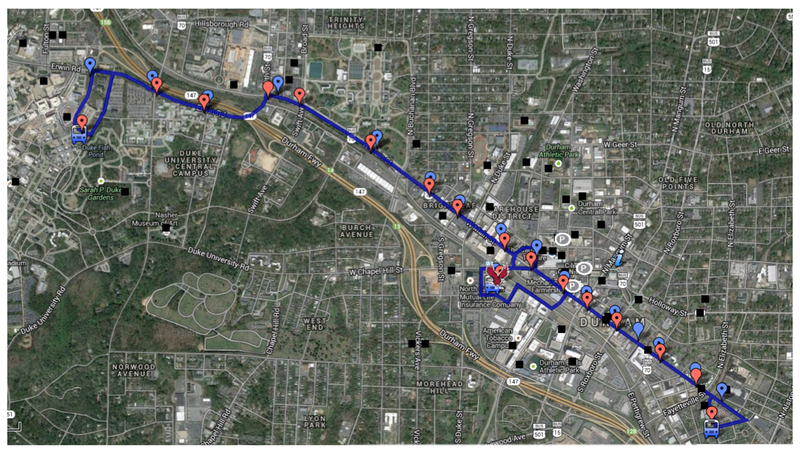 All of these areas are within walking distance from some sort of city center and are accessible by public transportation. This desire to be close to some sort of community is also reflected in the relatively shorter commuting times to work places in tracts with higher proportions of Millennials. Additionally, it is consistent with trends in other cities that tracts with high proportions of Generation Y members have many units available for rent at affordable prices, as many Millennials are burdened with student loans and trying to be debt free and secure some sort of emergency fund before purchasing a home10. It can also be seen that tracts with higher proportions of Millennials are more diverse, another defining characteristic of this generation. What Does this Mean for Durham? Because of the great universities located in and surrounding Durham County, as well as the promising professional opportunities in Research Triangle Park, Durham has already begun to attract members of Generation Y at high rates. Still, Durham has not experienced an influx of the same magnitude as cities like Philadelphia, Boston, Nashville, and Baltimore11. Because of this, policy for Durham should take a two-sided approach. First, in the short-run, Durham authorities should learn from and attempt to mimic some of the conditions in the aforementioned cities and parts of Durham that have already attracted high numbers of Millennials. Understandably, it is impossible for Durham to match the size, density, and connectedness of a city like Boston in the short run, but it can take some steps in the right direction. As seen in Figure 1, the most important factor for members of Generation Y when deciding whether or not to relocate is for job or career opportunities. It is clear that in order to attract Millennials, the city must make it worth it for them professionally. Durham’s government can help achieve this by offering incentives for companies that provide professional opportunities located in Durham or within reach of the city’s public transportation. Once attracting Millennials to the opportunities Durham has to offer, the city must accommodate the living needs of Generation Y. Durham authorities must make an effort either to expand upon community centers already in existence with more affordable housing or to plan additional centers that will be walkable to some degree, and have access to centers of employment. As an extremely connected and collaborative generation, members will also be attracted to high concentrations of young adults, as well as youthful, liberal, and creative ambiances. The addition of a 26-foot sky-scraper at the corner of Main and Parrish Streets, a redevelopment project led by Austin Lawrence Partners set to break ground in the Fall, is a step in the right direction for Durham. The high-rise, which will consist of a mix of retail, office, and residential space and is already in surrounded by award-winning restaurants, theaters, and sports centers, will be certain to attract young and professional adults and solidify the city’s downtown area, creating a high energy and urban environment. In addition to meeting the needs of Millennials today, Durham officials should learn from the case of Philadelphia and try to anticipate how the needs of Generation Y members will change in the next five to ten years. As shown in Table 1, young adults between the ages of 20 and 34 are concerned about living in a family oriented city that has good school districts and is safe in addition to having good career opportunities in the future. It is also true, that members of this age group still plan to invest in a home at some point down the road. Durham authorities should plan ahead for this need, so when the time comes to make the more permanent decision of buying a home and settling down with a family, Millennials do not choose to locate elsewhere. To do this, officials must work to ensure a safer and cleaner city, as well as school quality that rivals not only neighboring districts, but is competitive on a national level. The low quality of Durham Public schools in relation to Orange and Chatham County school districts will be one of Durham’s biggest challenges in retaining Millennials in the next decade. Possible solutions include raising teacher salaries as a way to attract better teachers, which may enhance school quality, or increasing per pupil spending; however, these solutions will also make Durham a less affordable place to live. Additionally, there is reasonable doubt to believe that increasing per pupil spending will translate into increased school quality in the homebuyer’s eyes12. Furthermore, Durham officials must work to create clean and safe neighborhoods consisting of affordable homes so that educated professionals will make the more permanent decision to stay in Durham. Over time, this may translate into better school quality for Durham, as the children of educated parents will be far less expensive to teach. Overall, Durham’s goals to create a better living environment for Millennials are complementary to one another and cannot be achieved alone. Professional job opportunities and urban centers must exist to attract members of Generation Y initially, and then safe and affordable housing communities must follow to retain them. Better school quality will hopefully ensue as Durham begins to consist of a more educated demographic. Policy throughout the next decade will be critical in whether or not Durham will continue to sustain high growth levels. 1. Bissonnette, Zac. 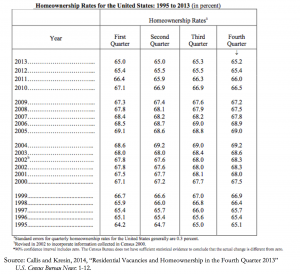 “Homeownership: The Elusive American Dream for Millennials.”CNBC.com. N.p., 28 Nov. 2013. Web. 23 Mar. 2014. 2. Bracken, David. 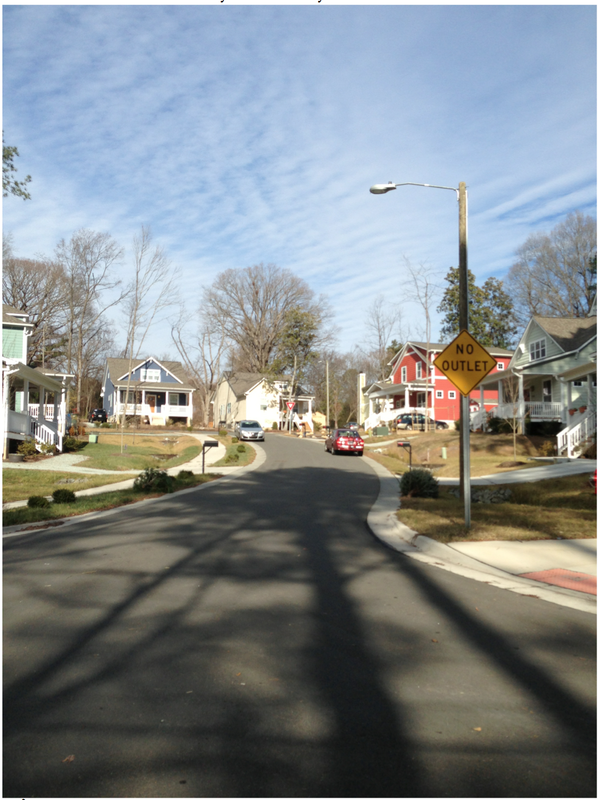 “Report: Triangle Home Prices Kept Rising in January.”&newsobserver.com (n.d.): n. pag. Web. 20 Mar. 2014. 3. Clapp, John M., Anupam Nanda, and Stephen L. Ross. “Which school attributes matter? 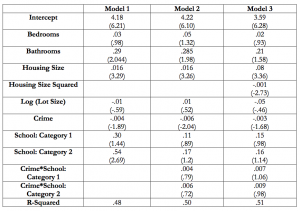 The influence of school district performance and demographic composition on property values.” Journal of Urban Economics63.2 (2008): 451-466. 4. DeBruyn, Jason. “Pew: Millennials with a College Degree Earn 38% More than Those without.” Triangle Business Journal. N.p., 12 Feb. 2014. Web. 20 Mar. 2014. 5. Durham, North Carolina Government. Durham City-County Planning Department. Forecasting Land Use and Trends. By Daniel Band and Holli Safi. N.p., Apr. 2013. Web. Mar.2014. 6. “Millennials in Philadelphia: A Promising but Fragile Boom.” The PEW Charitable Trust(2014): n. pag. Web. 20 Mar. 2014. 7. Millennials: Confident. Connected. Open to Change. Rep. Pew Research Centers Social Demographic Trends Project RSS, 24 Feb. 2010. Web. 21 Mar. 2014. 8. Roth, Bryan. “The Future of Duke’s Workforce.” DukeToday (2014): n. pag. Web. 20 Mar. 2014. By Mischa-von-Derek Aikman Does Living Near a University Boost Home Prices? 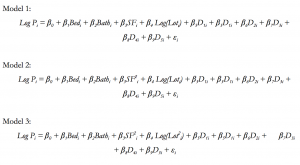 The purpose of this paper is to explore the possible existence of a correlation between the proximity of one’s home to a higher education institution (such as Duke University), and the monetary value of that respective home. I have decided to use the residential structures surrounding Duke University’s East Campus as the sample population for this study. 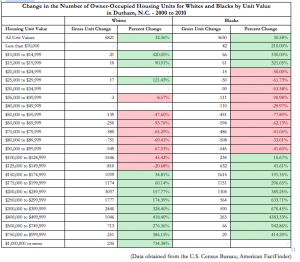 More specifically, I analyze and contrast the historical price trends for those homes located within one block of the perimeter of Duke’s East Campus, with homes located two blocks away from the same perimeter. The details of the specific geographic locations of these homes are discussed more thoroughly in the paper’s analysis. 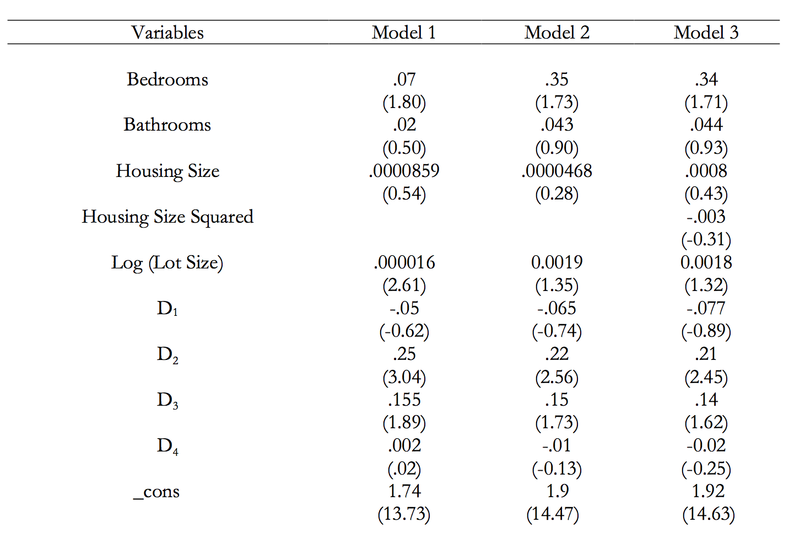 I propose that there is increased property value associated with living closer to the physical location of the University relative to living farther away. This difference in value appears to be apparent even in homes that are within one block of each other. 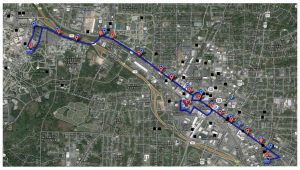 As mentioned above, the homes selected for the study were those located within a 2-block radius of Duke University’s East Campus. The annual historic prices of each of these residential homes between 2004 and 2014 were gathered using Zillow.com’s respective “Zestimate.” The “Zestimate” value is the median Zillow estimate of prices of all the houses in a given geographic location. 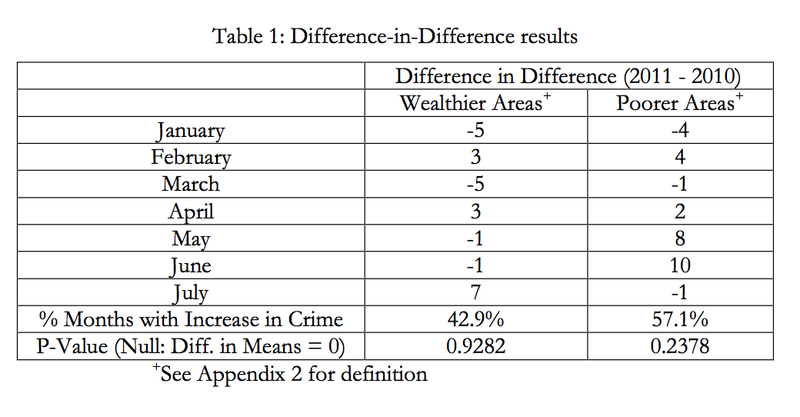 As of May 2010, the index had tracked over 200 metropolitan areas, and had successfully calculated the index for 120 of these locations. Therefore, the extensive nature of the index made it suitable for the purposes of this study. 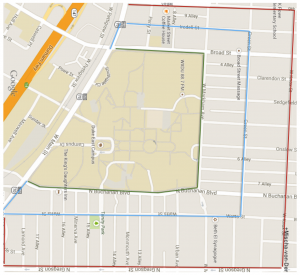 The homes were divided into two groups; one for those located within a one-block radius of East Campus, and the other for those located within the second block of the East Campus perimeter. 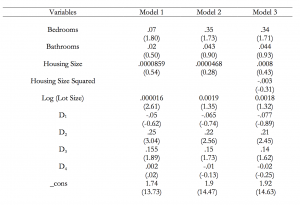 The reasoning behind this division was to determine if there is a significant price gap on average between homes located more closely to the University relative to those that are farther away. 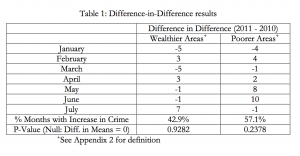 The specific monetary values for each home can be found in the appendix. The Zestimate at the Durham County level was also collected for this time period to be used as a benchmark. It is important to note that commercial buildings and apartment complexes within the given radius were excluded in an attempt to control for the types of residential structures being observed. 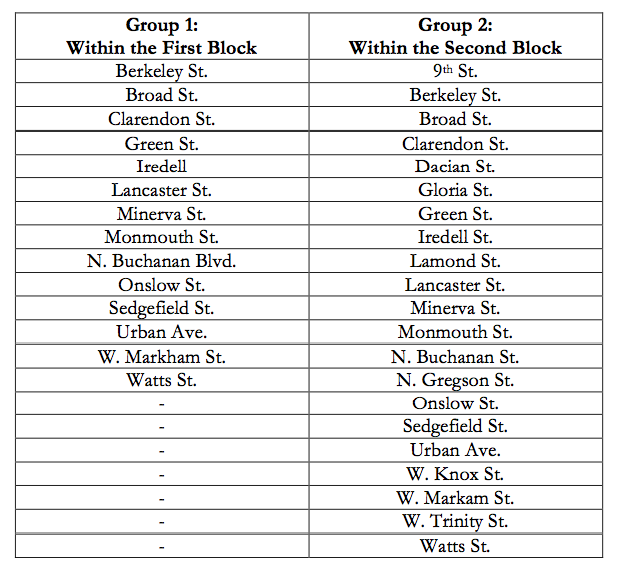 The table and annotated map below show which streets the two groups spanned. The homes that fall between the green and blue borders constitute those placed in Group 1 (located closer to Duke), while those that fall between the blue and red borders constitute Group 2 (located farther from Duke). 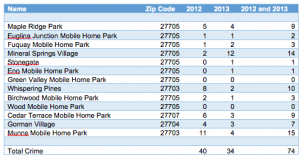 Pricing information was gathered for a total of 485 homes over the 10 years. 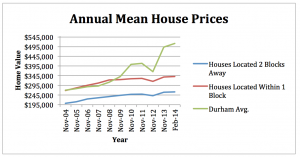 The mean home prices for each year was then calculated for both respective groups, and were then plotted against each other along with the Durham County level Zestimate. It is obvious that there is a significant and consistent price gap between those homes located within one block of Duke’s campus, and those situated two blocks away. It is also very interesting to notice that despite the price gap, both housing groups seem to have been appreciating at more or less the same rate over the past decade. Plotting the price gap itself, as we do in Figure 3 on the next page, shows an unequivocal spike in the price gap between 2007 and 2008. This can be attributed to the culmination, and subsequent burst of the national housing bubble in 2009. Trulia’s chief economist asserted that “geographical home prices was widest in 2007, the peak of the housing bubble.” This may have translated into the unusual widening of the gap at that particular point in time within this subsector of the wider housing market. Regarding the significant price gap between the two defined housing groups, we can look to the apparent economic implications of being located within close proximity of a prestigious University. Although extensive literature does not exist on these effects, it is common knowledge that Universities impact communities socially, culturally and economically. First, is the factor of employment. As of 2006, Duke University was the second largest private employer in the state. 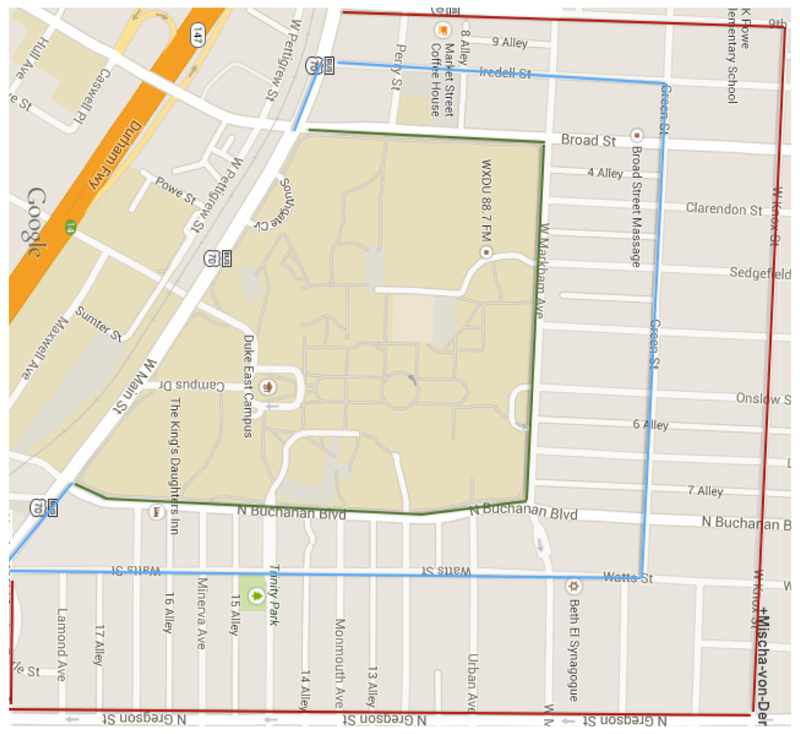 A significant portion of the population living within immediate proximity of the University (i.e. within the one block radius) will tend to be well-paid members of faculty and staff within some facet of the University such as health care workers and professors. Hence, these residents are likely to be more financially stable, and equipped to pay more rent than their average counterpart. While it is also probable that some percentage of these employees also live within the two block radius of campus as well, the desired real estate will be that which is more convenient, and therefore, closer to one’s place of employment. This augmented demand within a targeted group of individuals may contribute to the higher prices found within this geographic region. Second, is the very attractive opportunity to invest in real estate near Universities. Zillow’s chief economist, Stan Humphries, asserts that “a lot of students will live off campus, there’s built-in rental demand.”4 The very high flow of students and faculty from year to year lowers the risk investors run by renting homes to tenants near Duke, or any university for that matter. 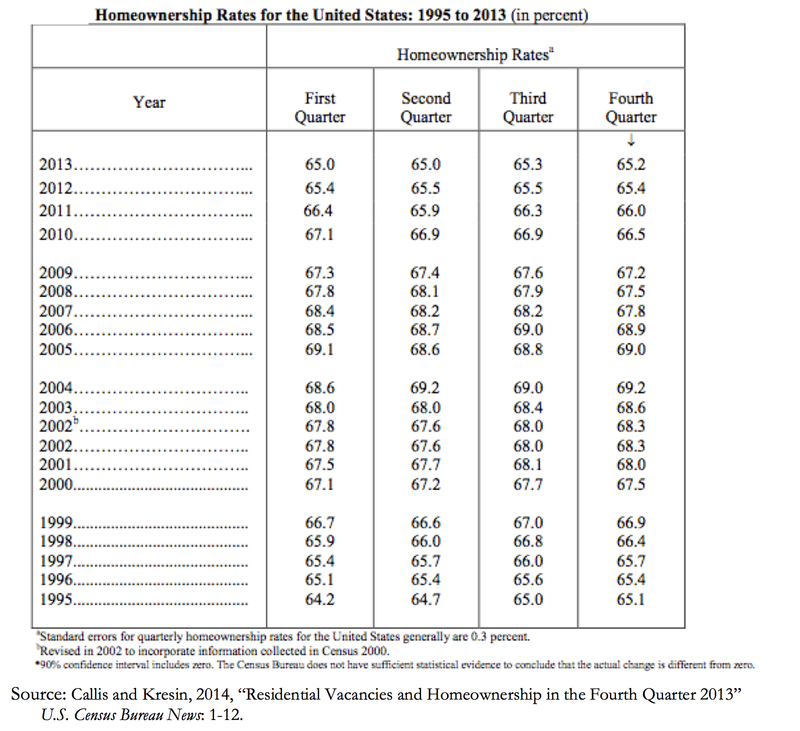 Vacancy rates will be much lower relative to other areas given the continuous demand for housing. Therefore, the heightened demand from the faculty and staff’s perspective, feeds the investor’s growth of demand, who are more confident in the long-term returns on their investment, as well as the short-term security of it. 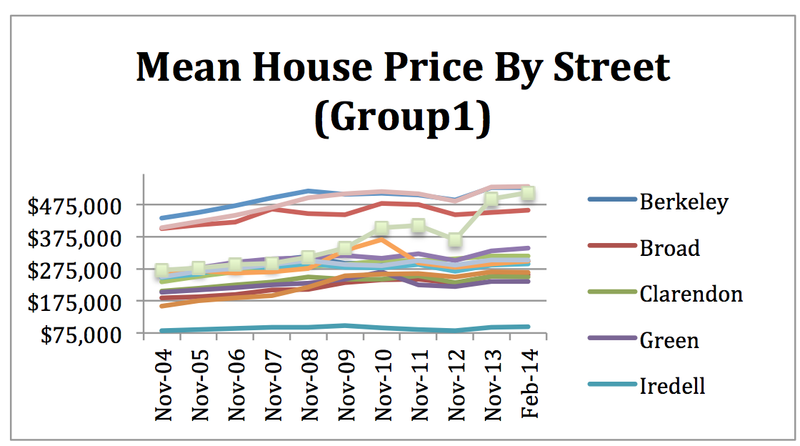 This might be another reason those houses in Group 1 were consistently valued higher than those in Group 2. Just as acquiring a beachfront property will typically cost more than the average home, it can be argued that the same is true with purchasing a home close to a University. 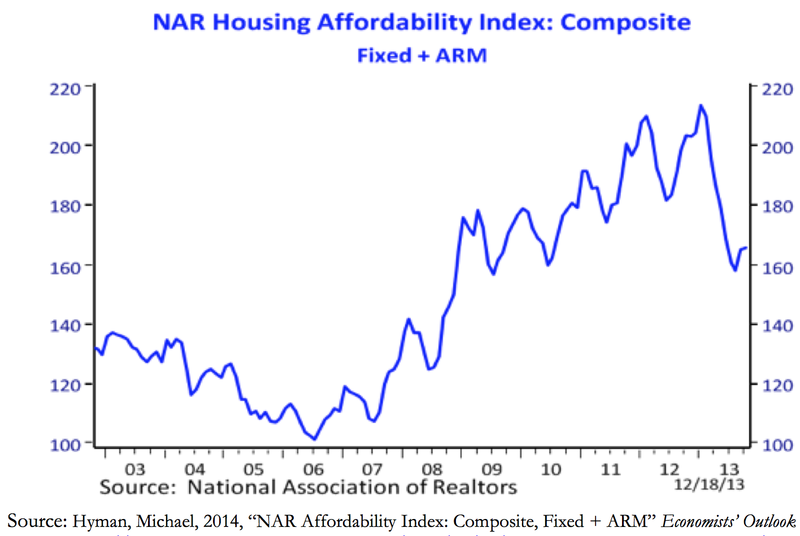 Housing is an asset that, despite crashes like that of 2008, ultimately appreciates over time. 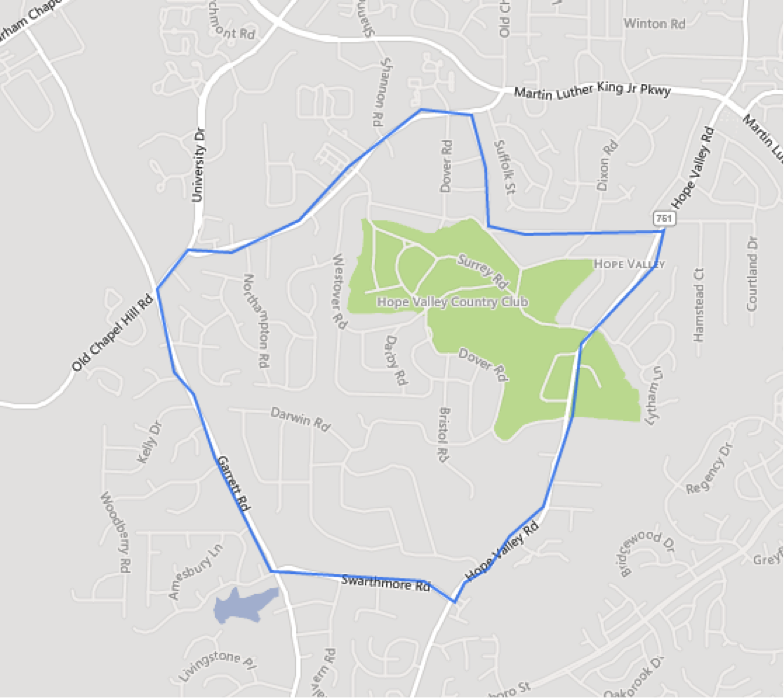 Being located near Duke University, one of three major points in the Research Triangle, intrinsically implies that one is located in an “established” neighborhood. It is very unlikely for the ‘status’ of this neighborhood to decline over time, as the physical University is essentially an immovable asset. This point is further supported if we take a closer look at Figure 2, which plots the Annual Mean House Price for both groups. 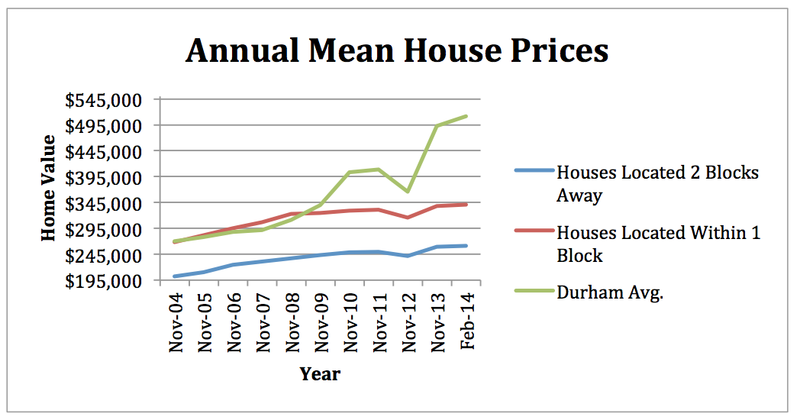 Although the housing bubble burst in 2008, Durham real estate prices in both groups did not experience a dip in prices until late 2012, leading into 2013. This three-year lag in the reaction of housing prices suggests that residencies located near a powerhouse University such as Duke may be privy to some level of insulation from national market occurrences. 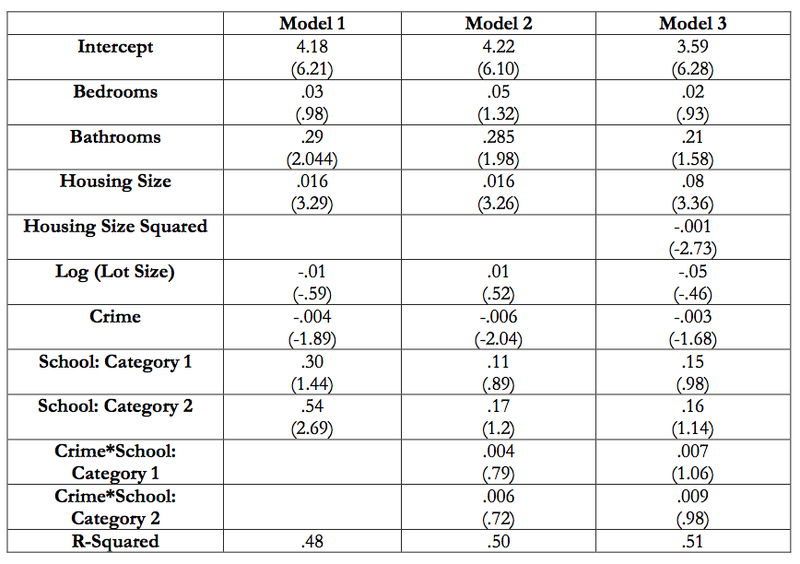 This supports the paper’s rationale even further as to why properties in Group 1 would be more desirable, and therefore, more expensive compared to those in Group 2. 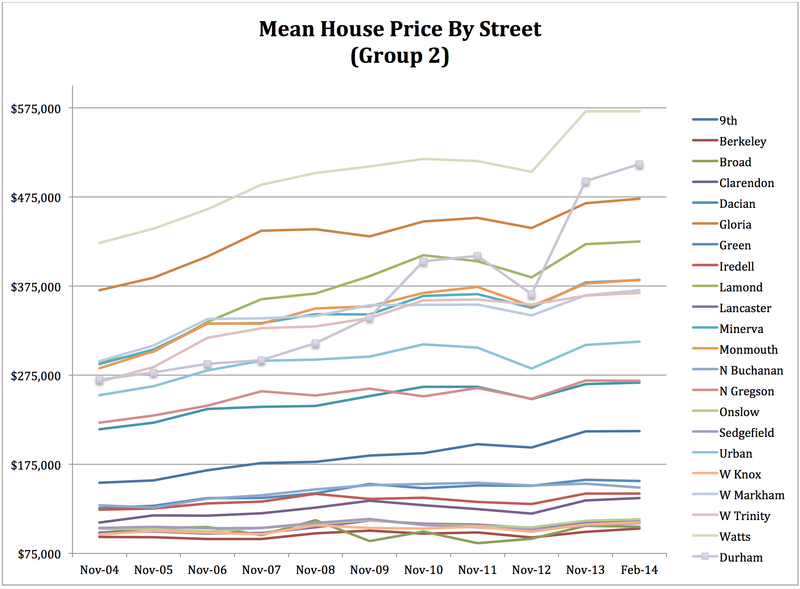 Another interesting observation was that while the house values were cheaper on average in Group 2 than they were in Group 1, there were a few outliers. 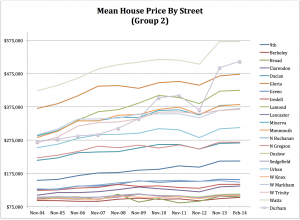 More specifically, there were occasional strips of Group 1 homes that were far cheaper than quite a number of Group 2 homes. 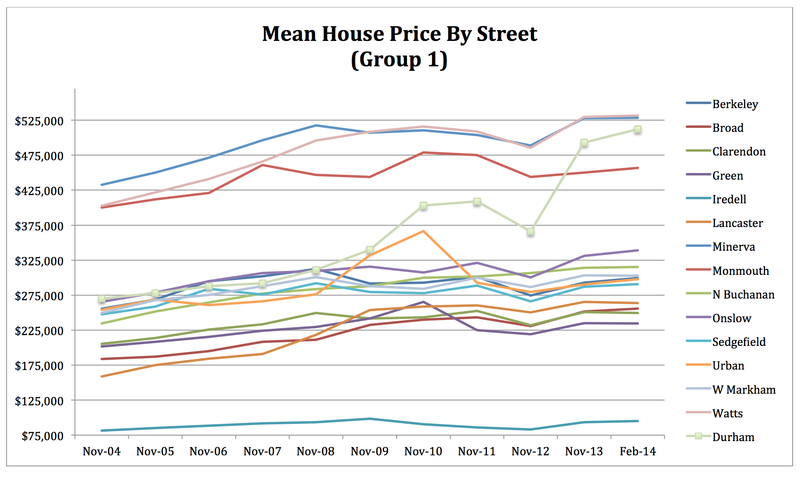 In order to isolate the streets along which these outliers existed, the historical mean price of homes were calculated for each street within each individual group (see appendix for Group 2 data). For the streets covered within Group 1, the majority of the mean historical prices were range bound between approximately $175,000 and $250,000. 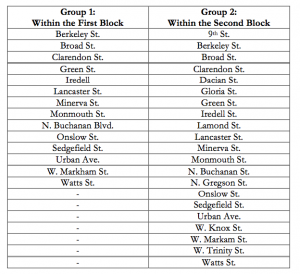 The means for Broad St., Minerva St. and Watts St. were all higher relative to the others with a maximum mean of $531,529. The obvious outliers in this case were those houses located along Iredell St, whose historical means floated very consistently around $75,000 throughout the entire decade. Why are these houses valued so much lower than the others found in its group? If one were to look closely at the annotated map in Figure 1, he will notice that Iredell Street was on the furthest most point of the boundary used to confine houses in Group 1. It is possible that the ‘one-block vs. two-block’ measure might have been too neat of a divide, and that the very outskirts of Group 1’s boundary had already transitioned into homes which fit the characteristics of Group 2 more appropriately. However, this outlier still did not cause for the hypothesis to be rejected. While the results of this study were informative, and supported the original hypothesis, there were a few facets of the experiment that may have limited the level of conclusiveness. 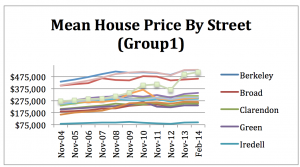 First, is the use of the Zillow estimate to gather the historical prices for the homes. 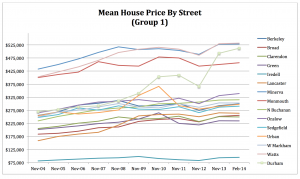 It was a suitable index to use within the scope of this experiment since it uses public data on house attributes and actual sales prices to develop its model. However, the academic community often criticizes it for its lack of publically available historical time series. Second, it is clear that the sample size used in the experiment is relatively small. Having surveyed 4,850 historical prices for 485 homes in Durham provides a nice picture for the community immediately surrounding Duke University. However, there would be great value in expanding the boundaries throughout a larger geographical spread within Durham. The final limitation is concerned with the method used to define the boundaries that divided the residential homes into two groups. As was seen in the “Isolating the Outliers” portion, the evidence suggests that the border may have been too rigid of a split. 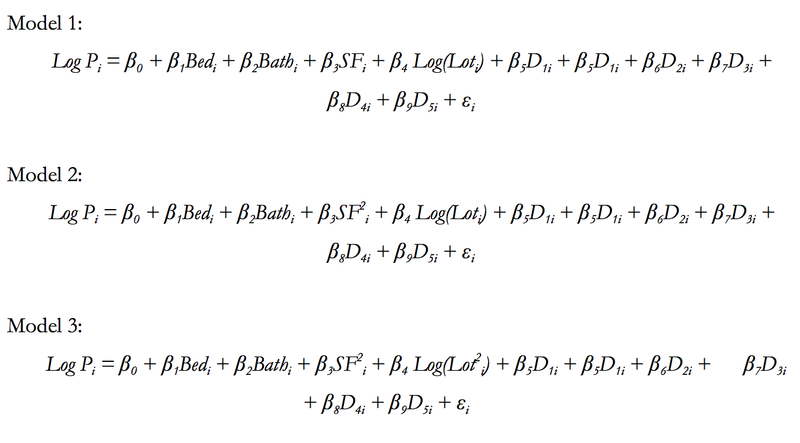 Perhaps one could observe more accurate price correlations using the metric distances from the center point of the university and each respective home. This allows the distance factor of the model to be continuous, not discrete, and can speak to even more meaningful relationships. 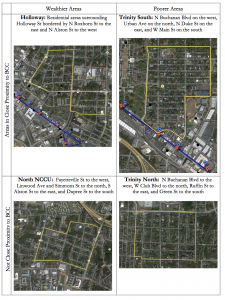 Using Duke University and Durham as a case study, we were able to observe significant relationships between historical housing prices for homes located closer to the campus (Group1) relative to those located farther away (Group 2). We noticed that while the houses in both these groups appreciated at rates that were relatively very similar, there was a consistent price gap between houses located within one block of Duke’s campus, and those located two blocks away. 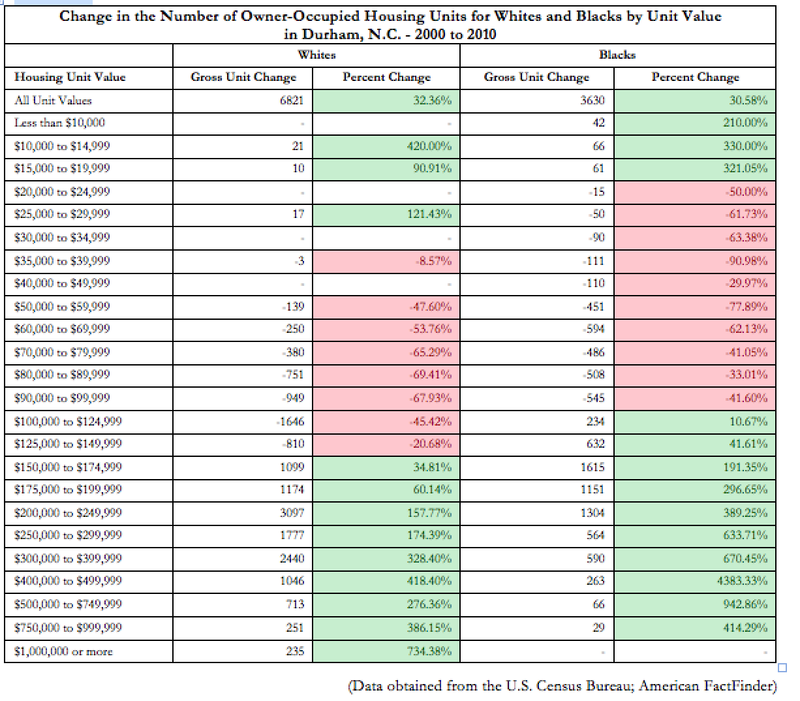 More specifically, the homes within the first block were consistently more expensive than those in the second block by significant amounts. Various reasons that could potentially contribute to the existence of this gap were discussed. These included the impact that Duke University has on the employment of those who live near campus, the attributes of homes situated near a university that attract investors, and what seems to be some kind of cushion against larger market phenomena such as the housing crash in 2008. 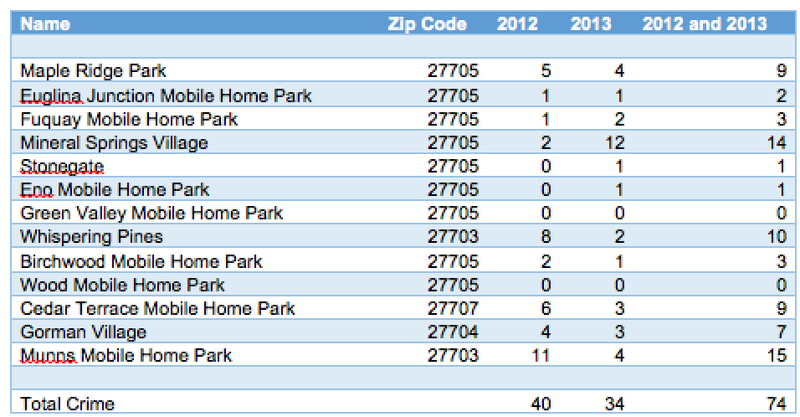 All of these supported the hypothesis that homes located closer the Duke’s East campus, were consistently more expensive than those located farther away over the past 10 years. Moving forward, it would be very interesting to conduct the same study on a larger scale for numerous universities across the United States. The differences in results between private Universities and State Schools, or between Universities whose campuses are compactly designed (such as Duke University) vs. those that are dispersed throughout a city (such as North Carolina State University) would prove to be very useful within this topic. Dougherty, Conor. 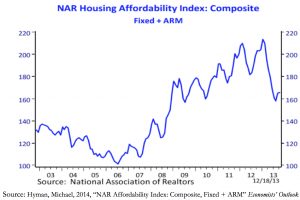 “Gap Between Most, Least Expensive Housing Market Still Wide.”Real Time Economics RSS. The Wall Street Journal, n.d. Web. 27 Mar. 2014. 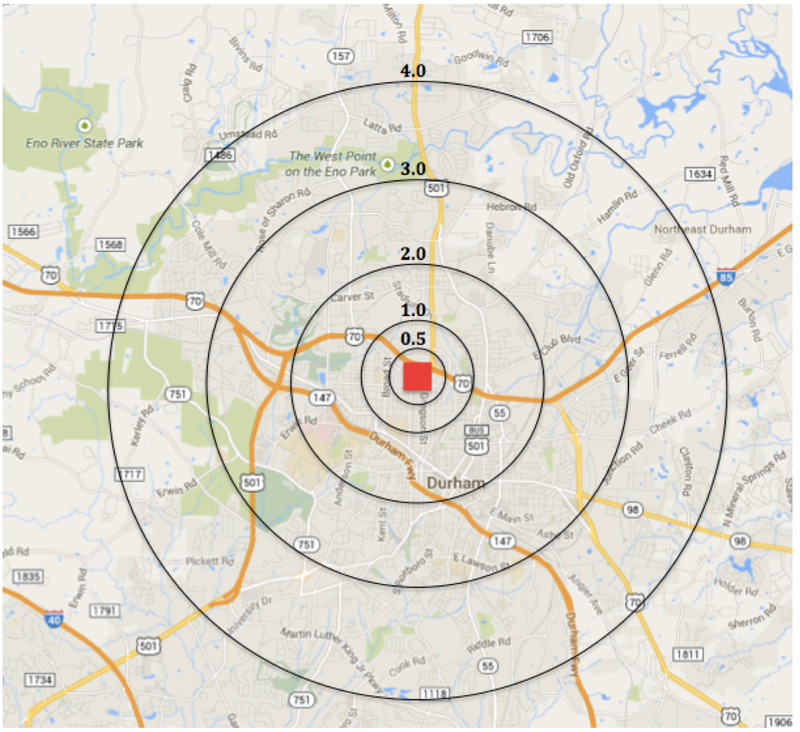 Duke and Durham:AnAnalysisofDukeUniversity’sEstimatedTotalAnnualEconomicImpactontheCityandCountyof Durham. Rep. Durham: Office of Public Affairs, 2006-2007. Print. Woolley, Suzanne. “Real Estate: Investing in College Towns: A Degree in Real Estate”. Bloomberg.com. Bloomberg, 5 Nov. 2012. Web. 20 Mar. 2014.